Before the invention of modern navigation instruments, sailors depended on lighthouses to warn them of dangerous shallow water areas in the Bay. The lights still provide sailors with basic information about their location. Each lighthouse flashes a different pattern of light to signify its location. Navigation charts show the location of each light and provide information on the light signal, color pattern of the tower, and fog horn signal. 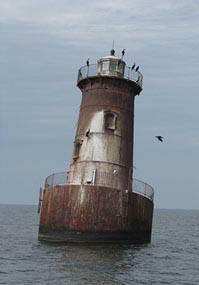 Early Chesapeake Bay lighthouses were towers of brick or stone built along the coastline. This is the classic lighthouse design many people think of when they think “lighthouse”. Examples of towers are the Old Point Comfort and the Cove Point lights. Forty-two screwpile lighthouses where built in the Chesapeake Bay between 1850 and 1900 – more than anywhere else in the world. Screwpiles where built on shoals or at the mouth of rivers. Seven iron legs were screwed into the bottom of the Bay in a hexagonal pattern. The legs were protected from ice by piles of stone. A house for the keeper was built on top of the legs and a light was placed on top of the house. The last active screwpile lighthouse is located at Thomas Point Shoal. 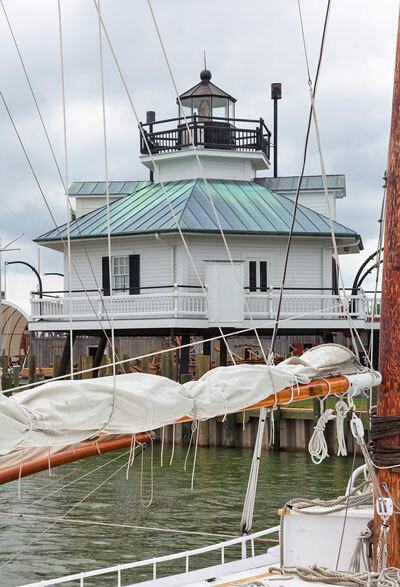 The Drum Point and Hooper Strait lighthouses have been moved to marine museums. In 1890, five screwpiles that had burned or been damaged by ice were replaced with a new kind of lighthouse. These towers were built on caisson foundations. The caisson foundations consisted of a cast iron cylinder sunk deep into the bottom of the Bay and filled with stones and concrete. The tower on top of the caisson foundation was built of iron or brick. Lighthouses built on a caisson foundation are very sturdy and all the caissons built in the Bay have survived. 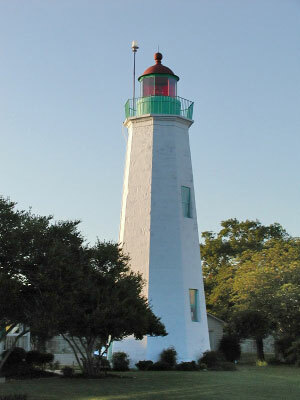 Examples of caisson lights include the Sandy Point Shoal and Smith Point Lighthouses. 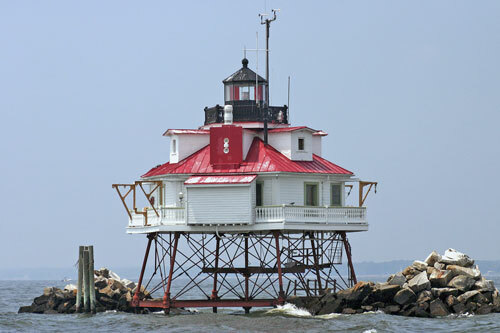 The Chesapeake Chapter of the United States Lighthouse Society, an excellent source of information including photos, history, directions and more. Chesapeake Bay Lighthouse Project, the result of one couple’s quest to visit and photograph all the lights. Terrific site.